Greg Shahade's U.S. 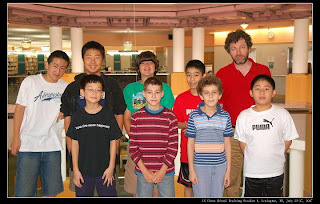 Chess School held its fourth session July 23-27, 2007 in Lexington, Kentucky. This remarkable school provides a week of intensive instruction with GM Gregory Kaidanov, at no cost to the participants. It is designed to assist dedicated and promising students in their acquisition of deeper chess knowledge. IM Irina Krush - 2007 U.S. Women's Champion! It went down to the wire, but in the end, IM Irina Krush stood alone atop the ten-player field to claim the title of 2007 U.S. Women's Chess Champion. In the nine-round event, she won five games and drew her remaining four, for a total of 7 points. WGM Katerina Rohonyan was the only other undefeated player, finishing a half-point behind Irina, and tied with IM Anna Zatonskih, last year's Women's Champion. The tournament website contains a wealth of information. Round-by-round photos by Betsy Dynako can be viewed here and the games, in .pgn format, can be downloaded here. Congratulations to all of the competitors in this hard-fought event. Players Batchimeg Tuvshintugs, Tatev Abrahamyan and Alisa Melekhina have appeared in my Scholastic Chess ChessCafe columns as scholastic players, and Elizabeth Vicary is a teacher and chess coach at I.S. 318 who has also appeared in recent columns. You can find her frequently within the pages of Chess Life and online at Chess Life Online. 2007 U.S. Women's Championship - Final Day! 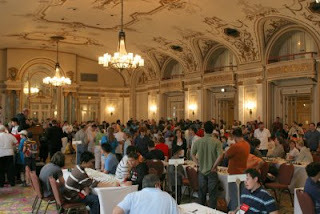 As this is written, the 2007 U.S. Women's Chess Championship is in its final round. It has been an exciting tournament, with relatively few draws and several twists and turns on the "leaderboard." For commentary, photos, games, and the tournament crosstable, go to the excellent tournament website. After five rounds of the 2007 U.S. Women's Championship, 25 games have been played. Only seven have been draws. Round two saw four of the five games drawn, but in rounds three through five, 13 of 15 games have been decisive. Currently, Katerina Rohonyan holds the lead with 4 points, with Irina Krush and Tsagaan Battsetseg a half-point behind. See the official website for games, photos and news. Live games are available here. Stay tuned for more updates. More info is available from www.uswcc2007.com. The nine-round championship concludes Friday, July 20. Games are available at MonRoi. My latest Scholastic Chess column is now available at ChessCafe. The entire column is devoted to the topic of Josh Waitzkin. We talk about the film Searching for Bobby Fischer, about Josh’s new book The Art of Learning, what he’s doing now, and what the future may hold for him. GM Yasser Seirawan annotates one of the many Kasparov-Karpov clashes in his July ChessCafe Inside Chess column. He looks at their 1992 Linares contest in which Karpov as Black defends with a Caro-Kann and Kasparov attacks (what else is new?) as White. Additional information is available at the MonRoi page for this tournament. It concludes Friday, July 6, 2007. 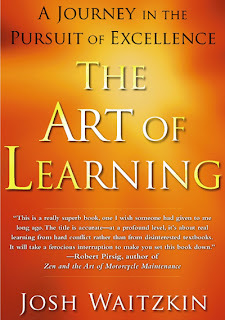 My review of Josh Waitzkin's phenomenal book The Art of Learning is now online at ChessCafe. This review will be at that page for about a week. It is also, however, permanently archived here. I saw that 2006 U.S. Cadet (Under 16) champion and 2007 U.S. Junior Champion Marc Tyler Arnold (2335) stands in 48th place, out of 73 players after four rounds of the 2007 World Open, Open section. Looks like he's having a so-so tournament? Not exactly. Round 1: He faced GM Eugene Perelshteyn (2611) and drew. Round 2: He faced U.S. Champion GM Alexander Shabalov (2671) and drew. Round 3: He faced GM John P Fedorowicz (2526) and drew. Round 4: He faced GM Bosko Abramovic (2609) and lost. We should all do so poorly. Of note is the fact that none of these ten are U.S.-born players. Krush, Zatonskih, Rohonyan and Melekhina are from Ukraine, Abrahamyan and Airapetian are from Armenia, Tuvshintugs and Battsetseg hail from Mongolia, Baginskaite is from Lithuania and Vicary was born in England. The nine-round single round-robin tournament will take place July 16-20, 2007 in Stillwater, Oklahoma, which was also the site of the recent U.S. Championship. 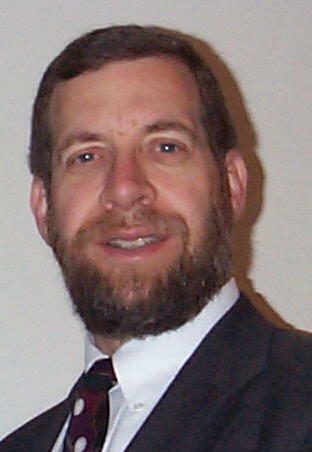 Both tournaments have been primarily sponsored by Frank Berry. A nicely done website for this event is available at www.uswcc2007.com. At least some of the games will be available at MonRoi.